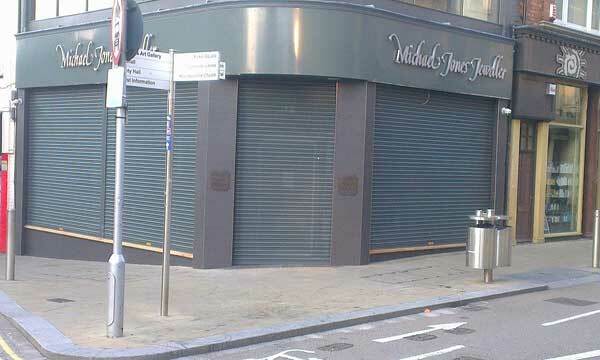 In conjunction with a bespoke nationwide shopfitter we were asked to manufacture 4no high security roller shutter doors to suit a refurbishment of Micheal Jones jewellers based in Northampton. The shop achieved national media coverage recently when an old lady (dubbed Super Granny by the media) stopped prospective thieves escaping on mopeds with her handbag during a foiled attack on the jewellers. 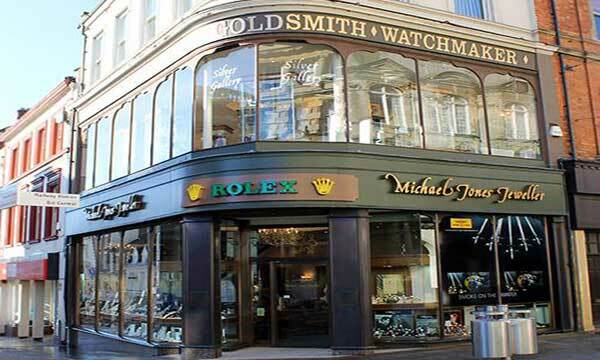 The jewellers is located in a highly distinctive building so our main concern was to maintain the traditional appearance of the building whilst still providing a practical solution. Our solution was to design, manufacture and install 4no perforated and powder coated roller shutter doors that are automatically operated via remote control operation to increase security and operating options. Each door was made to suit the very individual and bespoke application where every fixing is hidden. The structural support varied through the whole of the building due to its age and design including some victorian cast iron support columns that are now fully hidden within the new shop front.